HaitianCreoleMP3: Learn French and Creole Online in No Time! : Listen to Free Creole ebook Audio - Pages 1 to 7 From "Learn/Listen to Haitian Creole MP3 Dialogues, Phrases, Words + Audio Expressions, Sayings for Everyone Everywhere"
Listen to Free Creole ebook Audio - Pages 1 to 7 From "Learn/Listen to Haitian Creole MP3 Dialogues, Phrases, Words + Audio Expressions, Sayings for Everyone Everywhere"
In this episode, you will review haitian creole pronunciation of key vowels and consonants, nasal vowels, introduction to definite articles and negation in Creole. 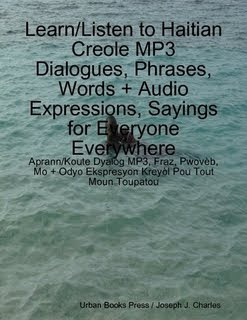 Pages 1 to 7 will provide you with new Creole / English vocabulary found in dialogues and conversations. A certain number of pages of the ebook, "Learn / Listen to Haitian Creole MP3 Dialogues, phrases, Words + Audio Expressions, Sayings for Everyone Everywhere" will form the content of each subsequent episode.